One of the most incredible aspects of the United States of America is that the nation is filled with almost every kind of landscape imaginable. From vast, arid deserts to snowy mountain ranges and everything in between, America is home to all kinds of terrain and a long list of unique geological features and natural wonders. The country also has an exceptionally long coastline with a lot of beautiful beaches to be enjoyed. However, the coastal states aren't the only ones that get to boast of some world class beaches; many great American beaches can also be found in inland locations, far from the Pacific or Atlantic Oceans. Many great examples of these beaches can be found in the Great Lakes region. The five Great Lakes of North America are the largest group of lakes in terms of surface area anywhere in the world and hold over 20% of the Earth's freshwater supply. These lakes are truly awe-inspiring to see, and Great Lakes beaches can be super spots to visit for people of all ages. Lake Huron is a great place to start. Stretching across the United States-Canada border, Lake Huron is the second biggest of the Great Lakes and is home to many miles of soft sand and pretty coastal trails. Like the other Great Lakes of North America, Lake Huron is one of the most popular recreational spots for both Canadians and Americans. Many international travelers also come to visit these lakes and admire their beauty firsthand, and one of the best ways to appreciate the scope and scenery of Lake Huron is to spend some time on one of the lake's many beaches. 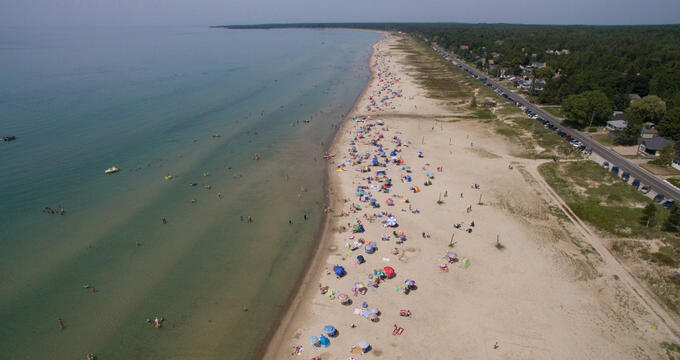 Some of Lake Huron’s beaches get a lot busier than others and some are better-suited for certain activities than other; read on to learn more about the best beaches in the area. Running for several miles in length, Sauble Beach is situated on the Bruce Peninsula of Ontario and is arguably the most beautiful Lake Huron beach of them all. The area gets some really nice weather for large parts of the year, offering just the right conditions for sunbathing and other beach activities, and this beach is also blessed with some of the softest sands you can hope to find anywhere in the Great Lakes region. Lots of good amenities are found nearby and the enormous size of this beach means that even on a major special occasion like the 4th of July, you can always walk a little ways down from the crowds and found a secluded spot to listen to the waves. Located in Lambton County in the southwestern part of Ontario, Canada, Grand Bend is definitely one of the most popular Lake Huron beaches. The local town has come a long way over the years and developed into a lively resort spot, attracting tens of thousands of people in the summer months and special occasions. The waters here are nice and calm near the beach itself, offering some good swimming and splashing opportunities, but are also well-suited to a wide range of water sports like kitesurfing, kayaking, and parasailing. Lots of different activities can be enjoyed here and there are several water sport operators in the area to help you organize your itinerary and make the most of your time. Another small Canadian town that really comes to life in the summer, Port Elgin is situated in Bruce County in Ontario. The town was first settled back in the 1800s but really grew in the 20th century as word started to spread about how picturesque it was and most visitors started heading out to the area on sunny days. The beach here is long and fitted out with lots of good amenities. Other local attractions and activities include the Port Elgin and North Shore Railroad and the annual Pumpkinfest special event. Lots of great walking trails can be found along the coast here too, and the beach is just a short walk from lots of highly rated cafes, bars, and restaurants. Located in the northeastern part of Michigan's Lower Peninsula, Hoeft State Park is another excellent Lake Huron beach. One of the best things about this particular beach is actually the fact that not too many people know about it. This means that, unlike some of the busier Lake Huron beaches, Hoeft State Park never gets too noisy or crowded. Many visitors to the park tend to spend most of their time walking along the many miles of scenic hiking trails or having picnics among the trees, but the beach itself is often overlooked. It's a grassy, sandy strip that stretches out quite a long way, and you can find a few benches dotted around as well as nearby restrooms and other useful facilities. If you're looking for a quiet Lake Huron beach with unbeatable views and a peaceful atmosphere, Hoeft State Park could be exactly what you need.